Grab your favorite tie-dye, your best bandanna, and don't shower for a week and prepare to folk rock around the globe with the newest addition to the Guitar Hero series: Folk Guitar Hero. Battle against, well maybe not battle as that's not in the spirit of folk guitar, so grab your folk guitar and jam with some of the greatest folksters to ever don the git-fiddle. 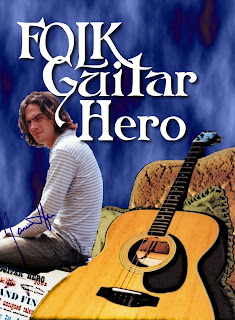 Folk Guitar Hero features 42 track of mind altering substance and feel good rhythms and beats that will make you feel like you are in the Blue Ridge Mountains, almost Heaven, West Virginia. Play classics from James Taylor, Cats Stevens, Bob Dylan, John Denver, and Ole' Willie. Once you start playing you won't want to stop till there is peace, love, and harmony in the world. Go online and ride the peace-train globally with fellow folk guitar heroes with the internet jam feature -- there are no strangers in these blue waters. (1) Folk Guitar Hero Software package. (1) Folk Guitar Controller modeled after the famous Martin Dreadnought guitar.